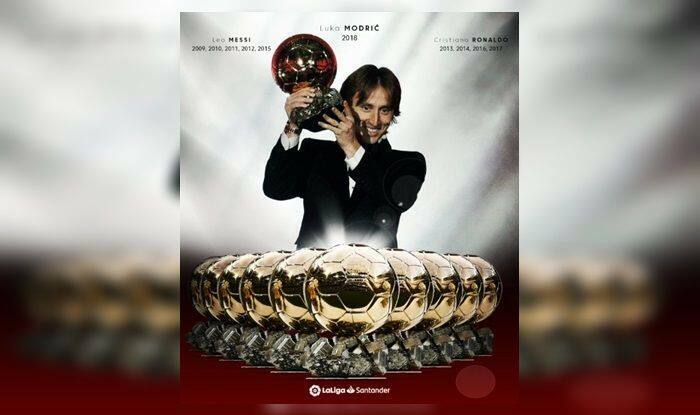 Ballon d'Or 2018: Croatia's Luka Modric became the first footballer apart from Argentina's Lionel Messi and Portugal's Cristiano Ronaldo to win the award since 2007. Ballon d’Or 2018: Croatia’s Luka Modric became the first footballer apart from Argentina’s Lionel Messi and Portugal’s Cristiano Ronaldo to win the award since 2007. Modric was a clear winner with 753 points, finishing second in the race was Ronaldo with 476 points, and he was followed by Belgium’s Antoine Griezman (414). France’s young star Kylian Mpabbe (347) finished fourth. Modric at 33, won his third successive Champions League in May before helping Croatia to a first World Cup final. The other names that made it to the top ten were Lionel Messi, Mohammad Salah, Harry Kane, Eden Hazard, Kevin de Bruyne, Raphael Varane. Both Ronaldo (2008, 2013, 2014, 2016, 2017) and Messi (2009, 2010, 2011, 2012, 2015) have won the Ballon d’Or prize the most number of times – five each, in the last decade. The coveted award has been in existence 1956, although between 2010 and 2015, it was named as the FIFA Ballon d’Or after being joined with the FIFA World Player of the Year.